Remove the stem and gills from the portobello with a sharp knife and cut the cap into 8 wedges. Place the wedges in a medium bowl. Cut the steak in 8 equal pieces and season with 1/2 teaspoon of salt and 1/2 teaspoon of pepper. Place the meat in the bowl with the mushrooms. Add olive oil, vinegar, rosemary and garlic. Stir to coat mushrooms and steak well. Cover the bowl with plastic wrap and refirdgerate for 30 minutes to 2 hours. Heat grill to medium-high and lightly oil the grate. Remove the bowl from the refridgerator. 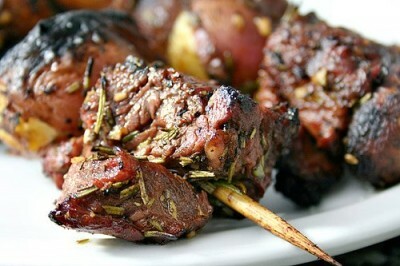 Skewer steak and mushrooms. Grill the kebabs and baste them as they cook for about three minute. Turn them over and cook another three minutes. Baste before thurning them back over. Turn over and cook for another 2-3 minutes. Season with the remaining salt and serve imediately!